€20 Gift Voucher for Powerscourt Garden Pavilion, County Wicklow. Set in the magnificent 1,000 acre Powerscourt Estate, Powerscourt Garden Pavilion boasts one of the most scenic and relaxing shopping experiences in Ireland! The Pavilion is located moments from Dublin and just 5 minutes off the N11 so you will be home in no time after an enjoyable day out. Over the past 280 years Powerscourt Gardens have evolved into one of the most exquisite gardens in Ireland and opening the Garden Pavilion in 2000 was a perfect fit with our knowledge and love of gardens. At the Pavilion, you will meet horticulturalists who are truly passionate about gardening and who will be delighted to share insider secrets on creating a part of Powerscourt Gardens in your garden at home. Featuring over 25,000 sq. ft. of plants, seeds, bulbs, house plants, patio planters and beautiful pots, the choice and variety at the Pavilion is superb. 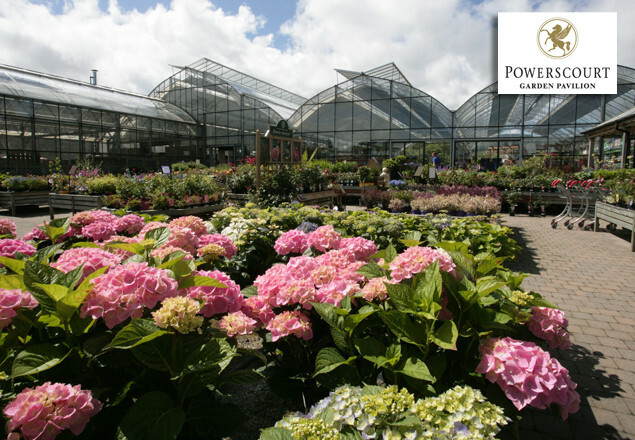 We only buy bulbs and plants we would be happy to grow in Powerscourt Gardens and choose the best quality, value and selection for our customers. The Garden Pavilion is not just a garden centre; it also stocks some beautiful giftware, pet care and great ideas to accessorise your indoor space. Drop in to get some expert advice from our horticulturalists and get your garden looking its best this autumn. Valid from 17th September 2012 until 17th December 2012. The voucher is not valid on sales items or Christmas trees.